Not all products in the market are unique. We've been accustomed to not being unique. But there are some moments in our life, when we really want to present ourselves with distinctness. Be it anniversaries, be it any occasions when gifts are shared or be it any formal ceremonies like wedding,birthday,graduation day etc, we always like to present ourselves differently. Not only on ceremonies, but we also love to have something trendy, snazzy with that distinct look on it. That's why we usually try to give that uniqueness on stuffs we love by printing our names,putting own photos,stickers or so. So, how about our Home's interior? Why not give them too a unique look personalized according to our mood,interest and choice? How about a bedroom and bedsheet covered with our own unique designs? How about pillow cover with a beautiful images which reflects one's mood? Possibilites are countless. You just think of one and rest leave upon VISIONBEDDING.COM. If you've recently moved to a new home or if you want to give your room a unique look or if you want to enhance your home decor, your search ends at VISIONBEDDING.com . VisionBedding’s wide variety of style, design, color, and personalization options ensures that, whatever category of bedding products you may be looking for, you’ll be able to select or create a delightfully unique atmosphere for nearly every room in your home—an atmosphere that will appropriately express each family member’s individual personality. From toddlers to teens and everyone in between, your children will be unable to resist the fanciful bedding patterns—in colors that range from whimsical to bold and from soft to brilliant—designed especially with them in mind. Grownups, as well, will be mesmerized by the incredible variety of decorating statements they’ll be able to make as they experiment with combining the many available options in countless ways to create just the right blend of charm and comfort to adorn both their bedrooms and their lifestyles. You may visit at visionbedding.com and instantly order your customized blankets,beddings,pillow shams,bedspreads,lap-blankets,complete bedding sets, and wall murals with captivating array of fully customizable new designs all availabe in different sizes and in serveral different categories including adults, teens, childrens, girls, and boys. In addition to that, shipping worldwide is easy go for visionbedding.com. But be sure, when you order online at visionbedding.com, don't forget to send your high resolution images preferably at 300 dpi or more for sharp and beautiful prints. In case of any doubts, using contact form on the website, one could get easy help and counselling. 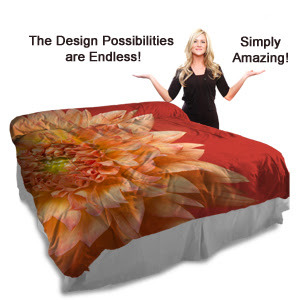 I must not forget to write that the perfect blend of technology and home decor is in the form of VisionBedding.com. Using the laPhotoBlankets production technology, all your favorite photo or digital picture is professionally and permanently dyed into the blanket fabric. And, the top quality of the fabric in use, it's almost unquestionable because, it's very soft to touch micro-suede fabric and the top of the blankets (picture side) is a plush whereas the bottom of your photo blanket is polar fleece which is very very soft and comes in 13 colors. VisionBedding.com surge stitch both layers together for extra durability. Therefore, VisionBedding.com is guaranteed satisfaction. 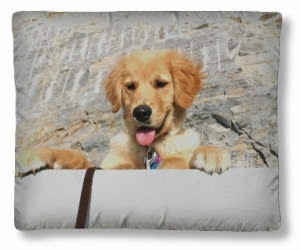 There are many many satisfied customers of VisionBedding.com. I'm just mentioning few of them. According to Steven Campbell, "pretty much the perfect gift. quality is outstanding. service was great." Likewise, Amy Anderson thinks,"Thank you Vision Bedding!!! You have made our Christmas so special! The quality of all my orders" . Similarly, Sheryl Hixson,"Thank You Vision bedding Excellent and awesome throw Good work.and fast shipping would recommend any.."
All these people couldn't be wrong. I had made three orders with them. My first order went well. The two afterwards were a nightmare! The blanket came and the graphic was not centered. At first, they gave me a hard time telling me that they would not return because it was a custom item. Additionally, they have two places on their website about returns. When you order, it says guaranteed or money back. On their FAQ section, it says since custom made, no returns! Then, after I got MasterCard involved and showed them pictures of how badly it looked, they gave me a refund. BTW - There is no telephone number, only email. They will only respond to email if you are ordering, not anything else. The third order never actually came. Again, no response to email until I threatened to cancel. Promising me shipment, nothing still have 1 month. I had to get MasterCard involved again. Don't use this vendor. Very poor customer service. Do NOT order from this company! There is no customer service, you can not talk to a person and they do not deliver on their promises. Save yourself the hassle and DO NOT ORDER!